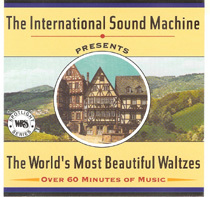 Some of the Great Waltzes with International Polka Music Hall of Fame® Fred Ziwich's International Sound Machine! Fred Ziwich and his International Sound Machine are well known for playing many styles of music. Fred Ziwich plays some of the great waltzes on this CD. Check out “The World’s Most Beautiful Waltzes”.